Barcelona remain on course to complete a treble this season, but speculation continues to suggest Ivan Rakitic could be on his way out this summer. The 31-year-old has been a fundamental figure for the Catalan giants since he arrived from Sevilla in 2014, making over 50 appearances in each campaign at the Nou Camp. That record is set to continue this year as he remains a vital piece in coach Ernesto Valverde’s plans, but rumours continue to link him with a move away from the club. As noted by Mundo Deportivo, Inter are said to be keen on signing the Croatian international this summer, but it’s added that his valuation hasn’t dropped from last summer when Paris Saint-Germain were interested in him, and so he could still cost €60m. Given his age, that would surely be a mistake for any club to spend that much on him regardless of the influence he could have and the fact that he clearly still has plenty left in the tank. In turn, it remains to be seen whether or not Barcelona are willing to lower that purported price-tag in order to sell, with Frenkie de Jong set to arrive from Ajax this summer. As noted by BBC Sport, Barcelona are said to be splashing out a whopping €75m+ on the 21-year-old, and so not only could that push Rakitic down the pecking order, but it could give reason to force the club to balance the books by selling him. 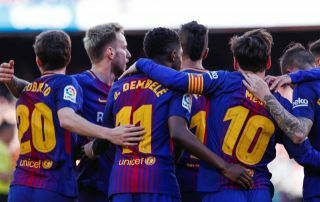 Time will tell if that’s the case, but as seen with the signings of De Jong, Arthur and Jean-Clair Todibo over the past 12 months, Barca are seemingly making a point of building for the future with long-term replacements for stalwarts and so a Rakitic exit surely can’t be ruled out this summer.